D etermining the most appropriate equipment solution to optimise independence and function can be daunting for many. At Coastal Rehab we have many years of experience in identifying a client’s functional needs and finding the appropriate equipment solutions. The emphasis is on providing an equipment trial so the client’s carers and family members can be confident that the equipment suits the environment where it will be used. look at pressure care needs and prescribe appropriate cushions and mattresses. 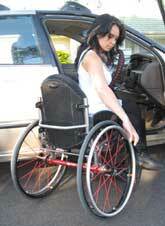 identify the most appropriate mobility device to improve safety and independence. customise solutions sometimes required to enable someone to feed themselves independently or to be positioned comfortably in bed. Coastal Rehab has forged close working relationships with suppliers to maintain an updated knowledge on equipment solutions and how to best apply them in the home and working environment. To discuss your specific case with an experienced OT in confidence today.